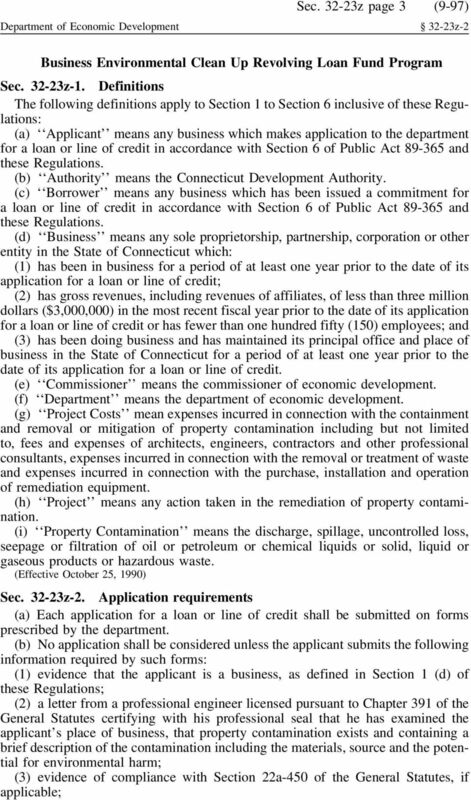 Download "TABLE OF CONTENTS Business Environmental Clean Up Revolving Loan Fund Program"
5 Department of Economic Development Sec z page 5 (9-97) 32-23z-4 (21) the amount, source, terms and conditions of any other financial accommodations which will be available to the applicant business, including the applicant s own equity contribution, if applicable; and (22) personal financial statements of all shareholders of the applicant. Sec z-3. Procedures for loans or lines of credit (a) Applications shall be reviewed and approved by the commissioner or his designee and authorized by the authority or, if the authority so determines, by a committee of the authority consisting of the chairman and either one other member of the authority or its executive director, as specified in the determination of the authority. (b) Upon approval by the commissioner and authorization by the authority, the borrower shall be issued a commitment letter which shall set forth the terms and conditions applicable to the loan or line of credit, including but not limited to the amount for which such loan or line of credit was made and approved, a description of the type and amount of security required to be provided the department, the term of the loan or line of credit, loan guaranty requirements, the rate of interest, affirmative action requirements, requirements concerning legal opinions to be submitted by the borrower s attorney, requirements concerning the provision of financial statements to the department or the authority and the permitted use of the proceeds of the loan or line of credit. (c) Each commitment letter shall be effective only upon execution by the commissioner and the borrower. 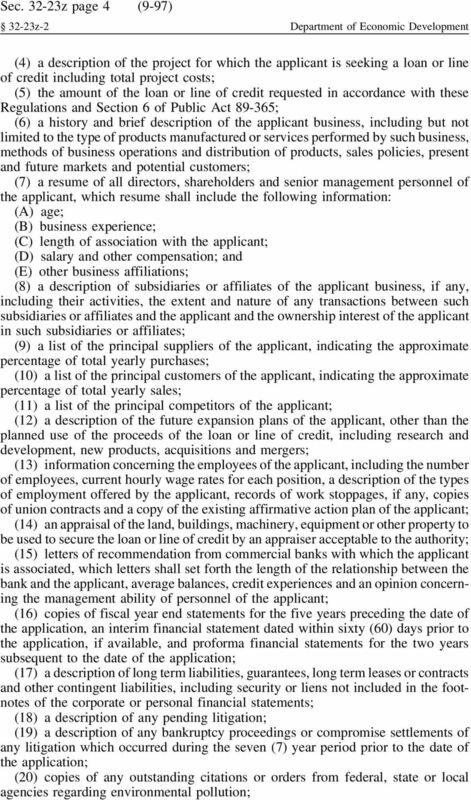 (d) If, upon examination of the application, supporting information and results of any investigation, the department and the authority reject such application, then the loan or line of credit shall not be made and the department shall cause the applicant to be notified that the application has been denied. Sec z-4. Loans and lines of credit (a) The loan or line of credit may be secured or unsecured as the authority determines to be appropriate under the particular circumstances. If the loan or line of credit is to be secured, the authority may require the borrower to provide the department as security mortgages or security interests in any or all of the following: real property, accounts, chattel paper, documents, instruments, general intangibles, goods, equipment, inventory or other personal property. The authority may further require the borrower to have executed and delivered to the department security agreements, financing statements, mortgages, pledges, assignments, subordinations, guarantees or other documents or evidence of security as and in the form required by the authority. (b) The term of a loan or line of credit shall not exceed ten (10) years from the date of the first disbursement. (c) No loan or line of credit provided to any single business shall exceed a total of two hundred thousand dollars ($200,000) in any period of twelve consecutive months. (d) The loan or line of credit shall be repaid on an amortized schedule of payments or upon such other method of payment of principal and interest as the authority considers necessary or appropriate in the particular circumstances, but in no event shall the payments be scheduled to exceed ten (10) years from the date of the first disbursement, as set forth in Section 4 (b) of these Regulations. 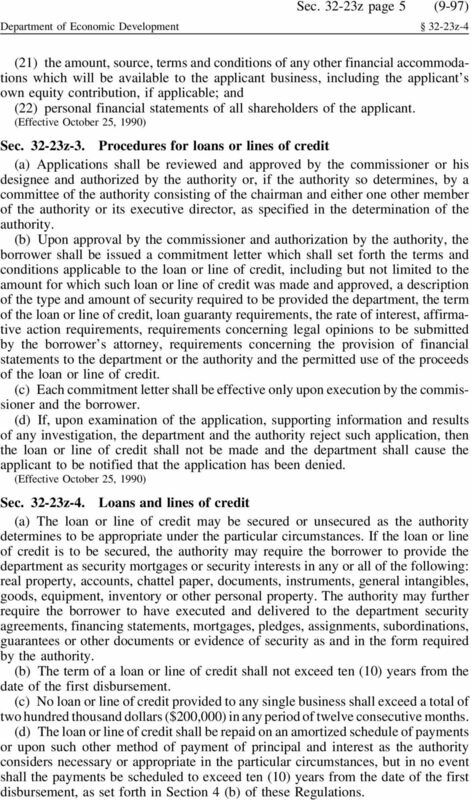 6 Sec z page 6 (9-97) 32-23z-4 Department of Economic Development (e) Disbursement of the loan or line of credit shall be made at the discretion of the commissioner in accordance with the provisions of the commitment letter and the instructions of the authority. Sec z-5. Note (a) Each loan or line of credit shall be evidenced by a promissory note which shall contain a provision permitting the borrower to prepay the loan in whole or in part upon any interest payment date. (b) The promissory note shall provide for the payment of interest at a rate not to exceed prime plus one percent (1%) as designated by the Wall Street Journal, at the time of closing. In determining such interest rate the department and authority shall consider factors such as the financial strength of the borrower and loan guarantors, if any, and the amount of security provided by the borrower. (c) The promissory note may provide for the collection of a late charge, not to exceed two percent of any installment which is not paid within ten days of the due date thereof. Late charges shall be separately charged to and collected from the borrower. Sec z-6. Default and remedy (a) The failure of the borrower to abide by the terms of the commitment letter, promissory note or other document delivered by the borrower to the authority or the department in connection with a loan or line of credit shall be considered a default under such promissory note. (b) The promissory note shall contain a provision that the failure of the borrower to make a payment of principal or interest due under the promissory note within fifteen days from the due date shall constitute a default. (c) The promissory note shall provide that upon default, any and all sums owing by the borrower under the promissory note shall, at the option of the commissioner, become immediately due and payable. (d) The promissory note shall contain a provision that it shall be an event of default if the project, as proposed or constructed, fails to comply with all federal, state and local health, environmental and safety laws and regulations. (e) The promissory note shall provide that upon default, interest on the promissory note shall automatically increase two percent per annum above the rate of the promissory note and such increased interest rate shall apply not only after default, but after any judgement rendered upon said promissory note. 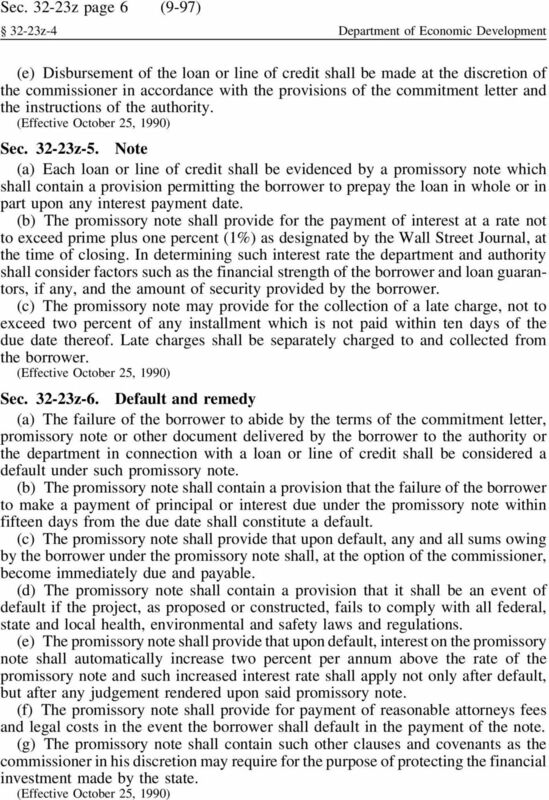 (f) The promissory note shall provide for payment of reasonable attorneys fees and legal costs in the event the borrower shall default in the payment of the note. (g) The promissory note shall contain such other clauses and covenants as the commissioner in his discretion may require for the purpose of protecting the financial investment made by the state. Glossary. is the process of increasing account value, usually associated with interest or other time-dependent increments of account value. Introduced Version HOUSE BILL No. 1473 DIGEST OF INTRODUCED BILL Citations Affected: IC 4-21.5-3-6; IC 23-2-5-3; IC 24-5-24.7; IC 24-4.5-1-202. Synopsis: Nonprofit facilitators of lending circle loans.